Weathernews launches Global Sea Ice Information website – Weathernews Inc.
Weathernews has launched its official “Global Ice Center” website in order to provide global unified sea ice information. The Global Ice Center has been collecting and monitoring global sea ice data, including ice concentration, ice thickness and ice drift, since its opening in July 2008, in order to provide unified global sea ice information to shipping companies. The Global Ice Center’s information covers such data as sea ice concentration, thickness and drift over not only the Arctic Sea, but also the Baltic Sea, the Sea of Okhotsk and the Gulf of Saint Lawrence. Recently, sea ice data from the Global Ice Center was utilized for a successful and safe voyage through the Baltic Sea by an LNG tanker operated by one of the world’s major shipping companies. In the near future, we will provide historical sea ice data, such as the first day of freezing, the first day of melting, the average rate and the largest amount of sea ice area. Weathernews believes that our official Global Ice Center website is able to support many shipping vessels across the world, in order to contribute to the safe passage of the vessels that brave the icy waters of the Arctic Ocean. 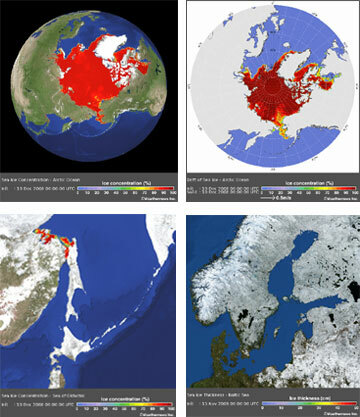 The Global Ice Center provides analysis information of sea ice conditions in all affected regions, using data from our original observation network and from organizations of various countries. The Global Ice Center original “I-SEE” model predicts sea ice concentration, thickness and movement out to two weeks, to support safe ship operation. The Global Ice Center, by using innovative technology in academia applied to sea ice data, is able to provide vital information to maritime companies, as well as feedback from ship reports.